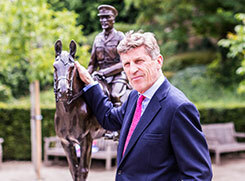 The success of the book Warrior: The Amazing Story of a Real War Horse enabled the Seely and Scott families to commission a stunning Philip Blacker bronze sculpture of Warrior. This was unveiled at Carisbrooke Castle on the Isle of Wight in August 2014, returning Warrior to his natural home almost 100 years to the day since he left for France in 1914. Visitors to the Isle of Wight can visit the statue at Carisbrooke and in 2015 a ‘Warrior Trail’ will also be launched enabling people to follow in Warrior’s hoofprints on the island where he lived (with a short interlude of four years during WW1) and died some 33 years later.